Our goal for 2019 is 2,500 toiletries for the homeless. As of March 22, 2019, the chapter has donated 799 toiletries for the homeless. So we are at 32 percent. What a great start! Thank you so much for caring. Remember that Daily Bread will take partially used items also. Please bring your items to the monthly meeting. Indian River Chapter is hosted a one-day Needlework Fair on Saturday March 16, 2019. We demonstrated multiple needlework techniques at the Suntree/Viera Library off Wickham Road in Melbourne. All volunteers spent the day and had fun demonstrating and teaching one-on-one to visitors! Over 70 potential members came through our doors helped along by Doreen and given membership information by Bernadette. Fun was had by all. Thank you to coordinator Suzanne Langfitt and her team of volunteers. . 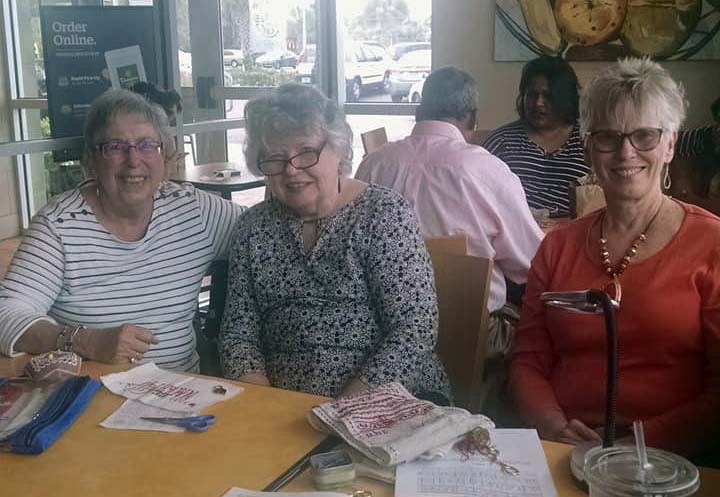 The Indian River Chapter of the EGA participated in the Stitching in Public Day Event, February 2, 2019! We had members at the following locations! Come join us! Southern Belles at the Panera Bread on Palm Bay Road from 11 - 1. . Jonalene Gutwein and Doreen Snyder at the Panera Bread at Post Commons- the corner of Post Road and Wickham Rd from 11 - 1. Adrienne Meyer at the Books A Million at the Avenues in Viera from noon to 2. The pictures shown are from the 2018 event! 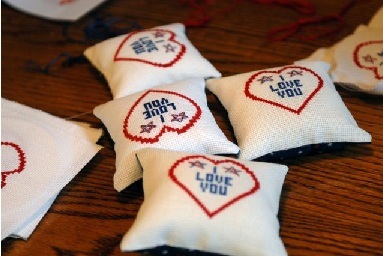 Our Kissing Pillows are stitched for deploying military stationed at Patrick AFB. Thanks to all the members who have been busily stitching our little Kissing Pillows to help us toward reaching our goal! We REACHED our 150 finished pillows goal for 2018. Our goal for 2019 is 100 pillows. This project is fast, easy and small enough to take with you to stitch wherever you go. Fabric and direction kits available and ready to be stitched. It is in giving that we show our soldiers, both men and women, that someone back home cares. I appreciate members putting their names on hearts when turning them in. Helps to keep track so each member who stitches five gets her name in the drawing for a free chapter membership. Call Adrienne to ask for a kit today. All supplies for cross stitching kits are needed for our soldiers and veterans at the Viera Veterans Administration Outpatient Clinic and the new VA Hospital in Orlando. Some of the kits are taken to the James Haley VA Hospital in Tampa where they are distributed to patients and their families. We are also collecting colored pencils, coloring books, and puzzle books for the same groups. IRC EGA members have started another lunchtime day group called the Patrick Stitchers. Members teach needlecraft at Patrick AFB. Members with Patrick AFB access should contact the Patrick AFB Library about meeting times and dates. Thanks go out to all our members who have given donations to pass along. Our current library displays are at Viera Library and Port Malabar Library. If you have any suggested locations, let Christine know. Thanks to all who provided beginner and intermediate pieces for previous displays. 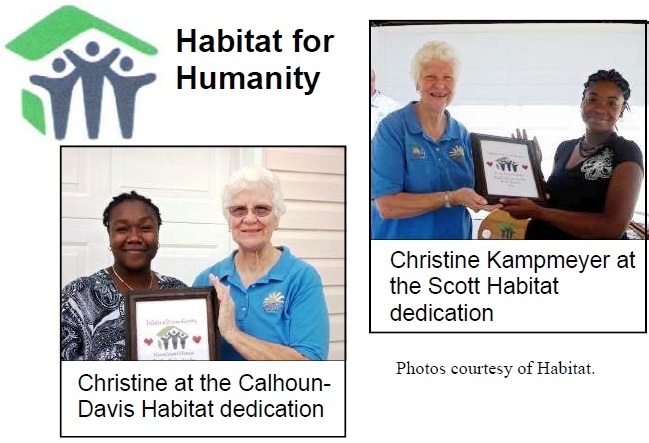 The Indian River Chapter, EGA supports South Brevard Habitat for Humanity. The chapter members began stitching Samplers for Habitat of Brevard County in the 1980's. To date, members have embroidered over 300 samplers for Habitat of Brevard County. Brevard County HfH branch has launched a building project to include 11 new homes in the Booker T. Washington area so samplers are needed. At least 6 houses are in the pipeline. Thank you in advance for your steadfast donation of time and love for this community project. Please attend any dedication if you can! It is inspiring. On May 21, 2016 Indian River Chapter presented its first sampler to St. Lucie Habitat in Fort Pierce, Florida. We need your support and we need some samplers stitched. New Sampler packages will be available at the chapter meeting. We also need a new HfH Coordinator to take over this project from Christine as she has been the primary POC for over 10 years. Find out more about Habitat for Humanity. Teaching Embroidery to Children Members of IRC will be teaching children at a new library location ins 2019 - The Melbourne Library on Fee Ave. At the suggestion of the children's librarian, IRC has reserved the large meeting room for August 6, 7, and 8 in 2019, from 1:45 to 3:45 for this program. The librarian will advertise the classes and hand the registration. .
We normally teach about 25 students each summer introducing children to the fun of needlepoint and cross stitch. Christine has been teaching children at the Masters Workshop on Lipscomb Street and has 8 students in the last class. Most of the children attend Stone Middle School. Cross stitch tended to be too difficult for the children to grasp, so more modern designs using a string art technique were selected. Christine punches each ground material to prepare it for class. As a reward for finishing, Christine provides a small frame for the stitched project and the finished pieces were displayed at the MLK Library in an IRC EGA Exhibit. Christine checked with the MLK Library program coordinator to see if we could teach a childrens embroidery program at the Library. Spring 2019 could be available. IRC EGA is working with the local Senior Adventures in Learning (S.A.I.L.) groups to offer needlework classes to adults.. We are teaching and setting up kits for these events. If you are interested, please contact Jean Simson who has wonderfully volunteered to be the coordinator for this project. The SAIL program is currently on Tuesdays from 11 - 12:30 from April 9 thru May 21, 2019. We continue to collect cancelled stamps (to Adrienne Meyer) and pop tops. The Einstein Montessori Charter School benefits from our coupons and box tops and uses them to purchase supplies and computer equipment. It is a school dedicated to children with reading problems, especially with dyslexia, and who are reading below their grade level. These are children that usually fall between the cracks and eventually drop out of school. They use a lot of computer programs and the LIPs program is used extensively. Please bring what you can to a general meeting or pass them along to Lyle at any Satellite Meeting. Christmas in July is our annual collection of gifts to benefit The Haven. Two representatives from the Haven visit our July meeting to speak briefly about the children's shelter and answer members' questions. At the meeting we present the Haven with donated items, including donations from our members. Donations to Haven representative in 2018.